Idea Broadband Launched In Pune - Download Speeds Up to 200 Mbps! Idea has already started offering broadband services, beating Jio to the market. The demand for data is growing, and telecom and internet companies are on the fast track to meet the growing demand. The Optical Fibre Cable (OFC) has been laid in a major part of metros around the country, and Aditya Birla led Idea Cellular has started offering its high-speed wired broadband services, starting with Pune. Called Idea Broadband, the company will provide both, Home Broadband and Ultra Fast Fiber Broadband plans under their broadband services. The Home Broadband Plans start at Rs. 449/- and go all the way up to Rs 949/- per month with a maximum download speed of 4Mbps and 600GB Fair Usage. The Ultra-Fast Fiber Broadband plans start at Rs. 699/- and go all the way up to Rs. 2,499/- with a maximum download speed of 200 Mbps and 500GB Fair usage. In the newly announced Union Budget, the centre has put focus to increase the broadband connectivity in rural areas. Active participation from the telecom players will help to increase subscriber base in rural areas and bridge the digital divide between Urban and Rural India. 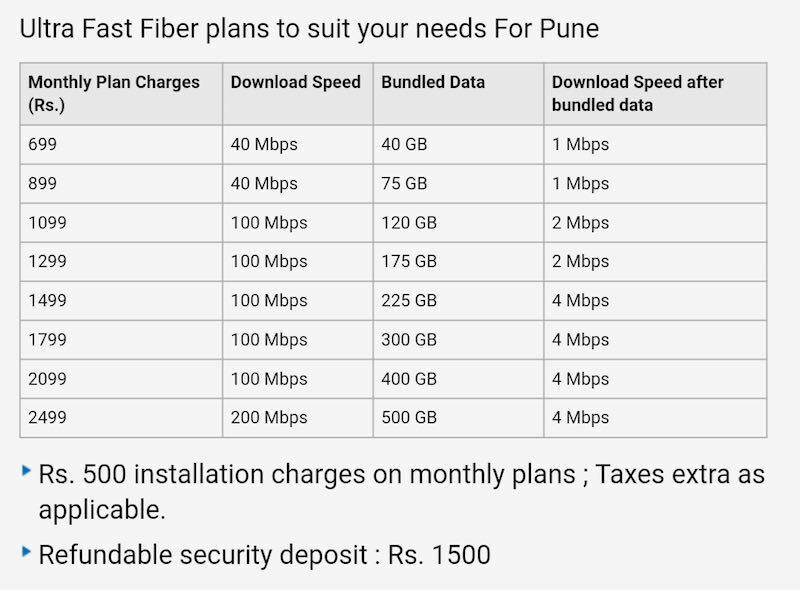 Ultra Fast Fiber broadband plans are currently available only in Pune, but soon the company will expand to other circles in Maharashtra and outside. After the launch of the Fiber Broadband, Idea is now offering broadband services in two categories. The Idea Home Broadband service is aimed at basic home users and currently has six broadband plans under the category. The base plan of Rs. 449/- offers unlimited internet with 30GB of FUP at 2Mbps download speed per billing cycle. Post FUP, the speed will be limited to 512 Kbps. All the plans offer unlimited data with a fixed FUP. The speeds differ with every plan. Idea Cellular will charge a one-time amount of Rs. 500/- as installation charges on the monthly Home Broadband plans. The installation charges will be waived off for those who opt for quarterly or half-yearly plans. All these plans will carry additional tax, which will be calculated on the base price. Idea Cellular has a total of eight plans under theUltra-Fast Fiber Broadband category, and mainly aims at small businesses and offices. The Rs. 699/- base plan offer 40GB of internet with a download speed of 40 Mbps. These are all high-speed, high-volume plans which cost more than the Home Plans. The prices exclude taxes, and Idea will also charge a refundable security deposit amount of Rs. 1,500/- for every Fiber Broadband connection. Idea PC Protect will be a free antivirus software from Idea which helps to safeguard all your important computer data from any virus attacks, phishing attempts and malware while browsing the internet. Idea PC Protect Plus will be a premium version of the standard Idea PC Protect with additional advanced features. Idea Music On Demand will be a free music streaming service. Idea has not confirmed whether these services will be offered with the standard broadband plans. Idea Cellular has already entered into the fiber broadband space. In the next quarter, users will get attractive broadband plans from Reliance Jio who is all ready to step into the segment with its JioFiber service. "Idea Broadband Launched In Pune - Offers Download Speeds Up to 200 Mbps! ", 4 out of 5 based on 8 ratings.